This version does not support copy code function, please note about this before you order it. It is a learning code wireless remote control switch (receiver), the output way /working way can be changed as you like, it is easy to match the transmitter. It has 4 Relays which can make the equipment turn or reverse, on/off and so on come true. The volume is small and the performance is stable and reliable, high receive sensitivity. 1. It covers application ranging from simple domestic remote control to autonomous control, like auto door, window, lifting equipment, entrance access, up and down controller, alarm system industrial control and security etc. 2. These remote controls are designed to control a wide variety of electronic devices with a wireless signal. 3. Extremely easy to set up and use. 4. Compatible with 2262 / 2260 / 1527 / 2240 etc chip and several code wireless remote control. So it can meet someone's need of choosing the wireless remote control as they like to work with it . 1. Press the learning code, the indicator flash, loosen your finger, press any button of the remote control, the indicator flash 2 times and off, it means you learn it successfully . 2. 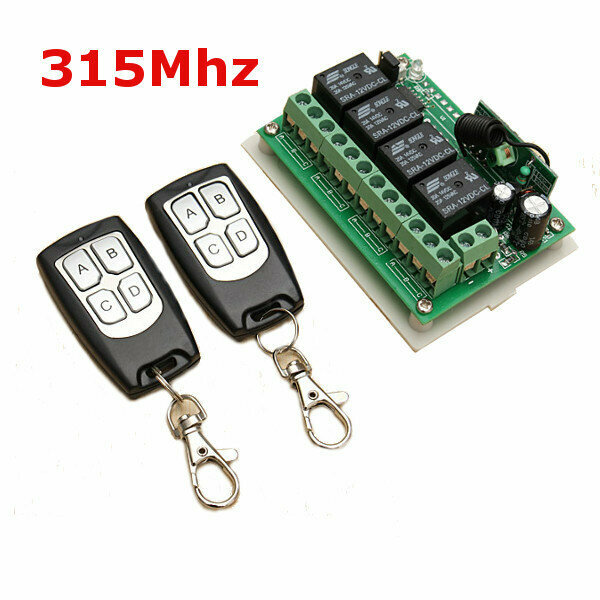 It can learn more than 12 PCS 2262 or 1527 chip with the different code wireless remote control. 3. remove/clean: press the learning button about 8 seconds , the indicator turn on to off, it means the information that you keep have been removed successfully. 1. Self-lock: JP2 connect 2, 3 position. 3. Inter-lock: JP2 connect 1, 2 position. Jog: press one button is ON, loosen your finger on the same button is OFF (need one channel switch and one buttons remote control). Self -lock: press one button for one time is ON, press the same button again is OFF (need one channel switch and one buttons remote control). Inter-lock: press one button is ON, press another button is OFF (need one channel switch and 2 buttons remote control).